Just when I thought that I'd recovered from the ending of the previous episode, "Sons of the Harpy," here I am, mind whirling away for the second week in a row. With the show diverging lots from the books this season, TV watching has become a roller coaster ride, indeed. Missandei is by an unconscious Grey Worm's bedside, and then the scene cuts to Daenerys looking upon Ser Barristan's body. Because he got killed in last week's episode! If I sound like I'm taking his death rather hard, well, you'd be correct. Daenerys wants the leaders of Meereen's great families rounded up and brought to her. Hizdahr is like, that's me! I'm the leader of my family! You're so smart, Hizdahr! Once the leaders are collected, they're herded to where the dragons are being kept. One unfortunate dude gets barbecued and eaten by Viserion and Rhaegal. Daenerys 1, nobles of Meereen 0. Sam is reading a letter about Daenerys to Maester Aemon. Jon arrives in the library to speak to Aemon alone and ask him for advice. Jon is about to do something that will divide the Night's Watch. Aemon advises him to "kill the boy and let the man be born." And so Jon goes to have a chat with Tormund Giantsbane and asks him who the Free Folk follow now. Jon says he's not Tormund's enemy. He wants Tormund to go north and gather the rest of the Wildlings. Jon will then open the gates and allow them to settle south. Tormund says they'll never kneel. Jon calls him a coward and unchains him. He urges Tormund to make peace to save his people. Tormund reveals that most of the Wildlings are at Hardhome, and they'll need ships to retrieve all of them. Jon says he'll talk to Stannis about lending his fleet. Tormund is adamant that he won't go to Hardhome without Jon. Jon puts his plan to help the Wildlings before his brothers, and, not surprisingly, the reaction is mostly negative. Even Dolorous Edd, still upset over the deaths of Grenn and Pyp (I miss them too, Edd) can't back Jon's proposal. As Stannis and Davos observe the contentious meeting, Jon argues that they can't just allow the Wildlings to become White Walkers. Later, young Olly brings Jon his meal, and Jon tells him he can speak freely if he has something to say. Olly wants to know if Jon is just tricking the Wildlings. Jon replies that it's not a trick and Olly reminds him that the Wildlings killed his parents (I believe they ate your parents, Olly). Jon tries to explain that winter is coming, but that just doesn't cut it. What is it with the Boltons and totally awkward meals together? This one was even worse than the time Jaime and Brienne were forced to dine with Roose, and Jaime wanted to stab Bolton with his dinner knife as Bolton nearly cracked a joke about Jaime overplaying his hand. See what I mean?! UGH! First we see Brienne staring out the inn window at Winterfell. 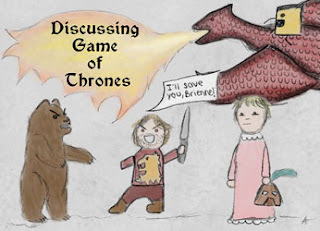 Pod says that maybe Sansa is better off at home, but Brienne is like, hellllll nooooo! Not with the Boltons! So she tries to get a message to Sansa that help is nearby if she should need it. And I think it's a no-brainer that Sansa is going to need it, possibly very, very soon. Ramsay's girlfriend, Myranda, is super jealous of Sansa. Ramsay tells Myranda that now that now he's officially a Bolton and no longer a Snow, he has to marry out of duty. Myranda pouts that she'll just marry someone else, too, and he's like, oh no you won't! The servant who reminded Sansa that the North remembers a few episodes ago delivers Brienne's message to Sansa, which includes instructions on how to signal for help. Myranda then catches Sansa alone outside and lures Sansa to the kennels, where she's shocked to find Theon. Theon later confesses to Ramsay that Sansa saw him in the kennels and begs Ramsay's forgiveness. What Ramsay does next is always a gamble, but this time, he forgives Theon. And so it's on to the awkward dining scene; the party includes Sansa, Ramsay, Roose, and Walda. Ramsay toasts his upcoming nuptials. Theon brings wine and Ramsay asks Sansa if she's still angry at what Theon did, and Ramsay assures her that Theon has been punished. Ramsay then proceeds to utterly defile "The North remembers" by speaking the line. That is wrong on every level of wrong. He also tells Theon to apologize to Sansa and just continues to put on a spectacular display of crazy, culminating in Ramsay declaring that Theon, being as close to kin as Sansa has left, will give her away at the wedding. Roose, rather tried of Ramsay's shenanigans at this point, has Walda announce that she's pregnant. Roose smugly notes that there's a good chance it will be a boy. Then it's on to some quality father-son time for Roose and Ramsay. Roose says that Ramsay disgraced himself at dinner then brings up Ramsay's mother, a very disturbing story made even more disturbing by Roose's matter-of-fact tone in telling it. In the end, Roose asks for Ramsay's help in holding the North against Stannis, and Ramsay agrees. Sam and Gilly are in the library when Stannis strolls in. You have to love how Gilly runs out of there. Stannis talks about Sam's father, Randyll Tarly, then questions Sam about dragonglass. Stannis then tells Davos that they're about to march. Davos asks if they should wait until Jon returns from Hardhome, and Stannis says nope. Selyse and Shireen are to march south as well. When everyone is ready to move out, Jon thanks Stannis for the use of his ships. And the Baratheon army is off. Grey Worm wakes up after three days, and Missandei is still by his side. He asks about Barristan. *sniffles* Grey Worm says that he failed and when he thought he was about to die, he feared that he would never see Missandei again. Awww. Daenerys asks Missandei for her opinion on what she should do then goes to see Hizdahr in his cell. He admits he's afraid to die and whines and grovels. She tells him that he was right, and she's going to reopen the fighting pits, but only to free men. Oh, and she's going to marry him! Tyrion and Jorah are in their boat. Tyrion is trying to make conversation, but Jorah barely says a word. They're sailing through Valyria, once a totally awesome place that was destroyed by the ominous-sounding Doom. Even the dragons died. Ah—but what's that flying in the sky? It's Drogon! The wonder of the moment is completely shattered when they're attacked by Stone Men, covered in greyscale. Jorah has to fight them by himself since Tyrion's wrists are still bound, and Tyrion, cornered by one of the Stone Men, falls overboard, and the Stone Man continues to try to drag him deeper under the water. When Tyrion next wakes up, he's on land again, having been rescued by Jorah. Jorah asks if any of the Stone Men touched him, and Tyrion replies no. But, as Jon Connington Jorah walks away, we see greyscale on his skin! NOOOOOOO!!!!! Arya! Dorne! Lady Olenna! Littlefinger gets interrogated by Cersei! Another wedding for Sansa! My mother has read the books and loved them. She is not liking how the series is alternating from the books, but I love the way the TV series is different from the books. I like to be surprised. Good review of the episode. I have mixed feelings about how the show is really moving away from the books this season. On the one hand, I do like the element of surprise, but on the other, some of the characters' storylines have changed drastically from the books, which makes me wonder what's going to happen to them in the novels yet to be published. But, that doesn't stop me from being riveted to the TV every Sunday night, lol. Lee I have much the same feelings as you do about the book to series changes. While I can dig the surprises, I don't much care for the drastic changes of some storylines. It was so good to see Danystep into her authority again and not constantly questioning and second guessing her decisions. And I LOVED seeing her dragons. I just want them to be FREE! Maester Aemon would have made somebody a great grandfather. He has such insight and wisdom. I love the advice he gave to Jon and his seemingly unshakable confidence in him and his decisions as Lord Commander. And I get that the Night's Watch aren't thrilled about Jon's plan. But you would think they would at least begrudgingly understand his reason. When the WW come, it's the Night's Watch who will probably be the first defense. Would they rather a few, or all the people left beyond the wall as well? And Poor Sansa. That's all I can say and shake my damn head. I don't know who is more horrifying, Ramsay or his father. But I feel an eensy bit better knowing Brienne is nearby and that Sansa isn't so easily scared as she was before. She seems to be a lot more cunning. Glad Stannis is gone so that red heffa can quit sexually harassing my Jon Snow. But I do wonder at the decision in the series to taker her, Shireen, and the Queen along. And I guess the whole storyline with Jon Connington and the Young Targaryen have been completely axed from the show. I don't know how I feel about that because it seemed it the books to be turning out to be a significant storyline. Poor Jorah got the greyscale now. Not cool. Overall this was a great episode. But I am so confused and wondering what will happen next. And it makes me want to get my hands on The Winds of Winter even more. Maester Aemon is such an amazing character; he would have made an excellent king had he taken that path. And I love his relationship with Jon. I'm frustrated with those of the Night's Watch who just don't seem to grasp how big the White Walkers' threat is in comparison to the Wildlings. Well, the joke's gonna be on them when they end up White Walker-fied! I get that the show runners are trying to streamline various book plotlines, but it's making me very, very nervous about how this will affect the future novels- the missing Jon Connington/Young Griff storyline is a good example. I've been feeling exactly the same as you- I am more desperate than ever to read The Winds of Winter!